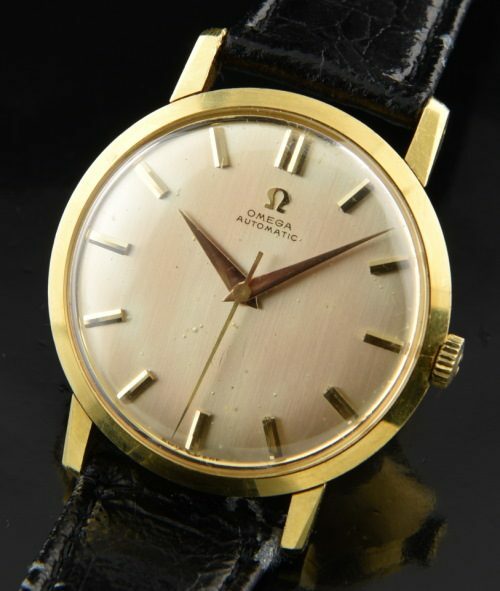 Home / Shop – Vintage Watches For Sale Used & Antique / Uncategorized / Omega Calatrava Original Automatic 18k. Omega Calatrava Original Automatic 18k. This vintage OMEGA watch reminds me of the Patek Philippe Calatrava in its simplicity and exudes the same finesse. The polished Dauphine original hands, gold baton markers and spectacular gentle patina that has appeared on this completely original dial draws the eyes. On the wrist, the gentle patina looks more even and age spots only lightly visible. Is stunning. Further, this watch looks larger than the 34.5mm. size of this solid 18k. gold case due to the narrow bezel. This watch was stored for decades and appears no have NOT been polished, with sharp edges and deep 18k. hallmarks. The OMEGA winding crown is correct. The caliber 501 automatic movement is shimmering like new-one of the cleanest movements I’ve found in an OMEGA of this age. The 16 million serial number dates this watch to about 1958. I HIGHLY recommend this vintage OMEGA watch-especially at this great price.